Number Plates: What are the Various Options Available? There are in fact numerous options available as far as getting the number plates is concerned. There are people who spend huge amount of money to get a desired number plate registration. There are a few who cannot afford such an expense yet wish to have something special as their number plate. For such people they can choose the initials of their name or their name itself to make the number plate personalized. When cost becomes the main hurdle in getting a catchy registration number, you can get it down in your own way with less expense. 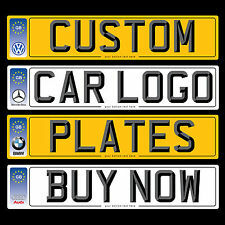 You can definitely get number plates using your names or initials at an affordable price. You can bring in customization by checking the availability of various combinations that may be available with the websites. You can choose between the new style and the prefix style and customize your number plate. Generally, trusted sources have millions of combinations saved in their database. When you are slowly working your way towards one specific registration, you can gain access to various matching plates and then you could perhaps choose the one that best suits your taste. The prefix registrations come in with a single year identifying letter followed by the number and again followed by three letters. The new style registrations come in with two letter prefix that is followed by two digit year identifier and then again followed by three letters. If you do not have the time to sit in front of your computer and browse through the various possibilities that you can have for your number plate, you may also get the number plate search application straight on to your smart phone. Peculiar number plates can be had when you opt for the Kiss and Miss Plates. You can also make acrylic plates of superior quality and flaunt your personalized number too. Investing in huge amounts in number plates auctions is not all that necessary. You can customize your number plates and make superior quality ones with the help of acrylic plates. When you make your search through a trusted resource on the web, you can rest assured that you will get access to quality systems that have been in place since a long time. And, when you also give your price range, finding a perfect match will become easier. Thanks to the comfort that the Internet and technology have brought to our lives, we can now sit from the comfort of our chair and place an order for numerous things and also make our personalized choice too. When we come to the options point, you can understand that we have the prefix format, the suffix format and the current or new style format that is predominantly used in the UK. Apart from these formats, we also have the dateless or the cherished number plate format that has been active right from 1963. There is no identifying year or numbers or letters and can be easily assigned to any type of vehicle regardless of the age of the vehicle. Mike Jordan is an accomplished writer and number plate registrations is a topic that interest him greatly. He has written quite a number of articles related to the UK National Numbers.